Are you looking for a good electric shaver for personal use? Then I would recommend the new Panasonic ES-LT71-S Arc 3 Mens Electric Shaver. I had an old Phillips shaver in the past but when the battery died out, I set out to compare between the different brands and decided to go with this Panasonic product. This new shaver completely blew me away in terms of features and quality. It boosts a patented three-blade shaving system. It offers maximal comfort and a great shave allowing you to look good throughout your day. I had major issues with other brands of shavers in the past because I have sensitive skin. The Panasonic ES-LT71-S Arc 3 Shaver offers me a close and comfortable shave without giving me any cuts or bruises. The pivoting head of the shaver worked effortlessly on the whole skin surface and contour. It is overall a good quality product that is well designed and light weight for its job. I also travel a lot on the road and the shaver’s switch locking system makes it ideal for the traveler. It is also waterproof so I can use it in the bathroom or in the shower, unlike some other shavers I have tried. I can also clean it under the tap after use without any problems. For those who prefer a dry shave, then the shaver also works well if you need to brush up quickly. What I also like about this shaver is that it has a self cleaning system. This means that the shaver can clean and dry itself after each individual use and makes shaving a hassle free experience. I don’t use this option very often as I prefer to clean the shaver myself but others will find this useful. The recharging process is quick and unlike my old shaver does not give a loud humming noise. The only problem I found with the shaver is that when I tried the dry shave option initially, I did have a mild amount of skin irritation after use. However I do have very sensitive skin and once I switched to the wet shave the problem completely resolved. This is probably because it takes time to adjust to a new shaver. For those with sensitive skin, I would advise sticking to a wet lather shave for at least a few weeks before you switch over. 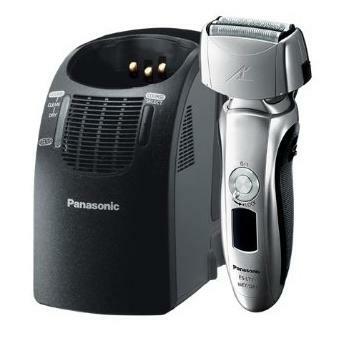 Overall, I am very satisfied with my purchase of the Panasonic ES-LT71-S Arc 3 Shaver. It is great value for a good electric shaver and rivals other competitors. It is portable, well designed and is completely waterproof allowing you to carry around on your travels. The shaver also gives me a comfortable and close shave. For those people with sensitive skin then you may have to readjust slowly and stick with wet shaves at the beginning but you should find that the new sensation settles very quickly. I would recommend this product to all those looking for a good quality electric shaver.